I stand before you today on what is a rather sad note. On Tuesday 8 October Frank Brierley telephoned me to tell me the very sad news that Bob had passed away. I did not know what to say. A little later that day Mary phoned me, which was perhaps just as well. I had intended to ring her but she beat me to it and phoned me which as I said was probably a good thing, as I still did not know what to say. Even so we spoke at some length but when I put the phone down I burst into tears. That does not help matters - it does not put the world to rights - it does not make the world change in the conduct of its business. Throughout life you tend to look at mankind and see the admirable qualities that make the top person. All these good qualities, Bob held the lot. Now who was Bob? Basically throughout his life he was a cyclist - a very keen and a very strong cyclist. His map reading and compass work were above average. As a photographer he was in a field of his own. He was also an author of some merit. In cyclists' jargon he was a bikie pure and simple. Above all, he was a gentleman. So it comes to pass that I was elected to speak to you today and say a few words about Bob. A few words? Hardly enough, as I could stand for hours and tell you the admirable qualities, and way of life and conduct to the world which Bob possessed. Even so, a friend has already told me to keep it brief. What of those qualities? Bob was kindly, generous, sincere and honest. A great strength of character. He was not backward in professing his views and was not slow in putting them into words. Some of his words did not always please everybody but that did not trouble him. Bob and I lived about 250 miles apart so I did not see him as often as I would have liked, but when we met and rode together I knew that I was riding with the top man. I should imagine that if you totalled up Bob's lifetime it would come to a considerable quantity. We rode in diabolical weather, we rode in the sunlight. Then we thought our world would go on together. Regrettably that is not so - and some day it must end. Bob and I have ridden on roads, tracks of grass, sand and rocks. You name it - we rode it. When I retired, Bob was waiting, and we immediately spent four or five weeks in northern Scotland (mainly in diabolical weather). A good cyclist needs to be many things - a great bike handler, a mechanic, a map reader, photographer, and above all have that great sense oh humour that is essential to be an outdoor sportsman. Bob said he was no cook. One day, however, he shovelled everything into a frying pan and brewed it up. Actually it was the meal of the century. Of course I was not the only man to ride with Bob. Many persons, probably here today, have ridden with this superb rider - and enjoyed it. Bob's knowledge of the roads, tracks etc was infinite. As a cyclist he featured well in that world and was well thought of. When the Rough Stuff Fellowship was formed he came into his own. It would not be exactly true to say he formed the Fellowship, but in the beginning and in the early years his industry in Lancashire put where the Fellowship where it is today. Comradeship and friendship are excellent in sporting circles, but in the Fellowship it is second to none. A friend from South Wales phoned me recently and said, "Bob is the Fellowship and the Fellowship is Bob". Now we come to the final chapter. The Great Timekeeper has marked Bob off on his last ride. So now Bob has departed. At this time you often find that remembrance fades and sometimes ceases. This is different - Bob - we will never forget. A final word on the loss. The loss is terrific and the Wheelers' World has lost an expert. And myself - what have I lost? I have lost a very good friend. Bob died on 8th October in the way he would probably have chosen, whilst cycling on his way to the weekly meeting of the Dover Cycling Fellowship at Lydiate, near Ormskirk. I joined the RSF in 1969, the year Bob was elected as our President, a post he held till 1985. He also acted as Lancashire Area Secretary from 1955 till 1974, and was still organising and reporting our local meets until this year. He was very knowledgeable about all rough-stuff areas, particularly north of the border, I enjoyed some excellent cycle-camping holidays with Bob and sometimes a few others in Scotland and other areas, and also in earlier times the suppers and slide shows we had in each other's homes. At AGMs and other meets it was quite accepted to follow Bob's white cap for a well-planned day out. For some years he had suffered some heart problems, at one time he had a pace­maker fitted, but this was later removed; but it was impossible to keep him off the bike for long. The Fellowship has lost a great personality and I feel that I have lost my best friend, who has often ridden twenty-odd miles to visit me whilst I have been temporarily(?) disabled. Our heartfelt sympathy goes to Mary, his wife. Bob was a cyclist from his very early years and was always active on his bike. The only break was during War Service as a soldier stationed in the British Armed Forces just outside Basrah in Iraq. He was a worthy friend, a strong man, who never had any difficulty on any track in this country or abroad. Alps and Pyrenees areas of France. 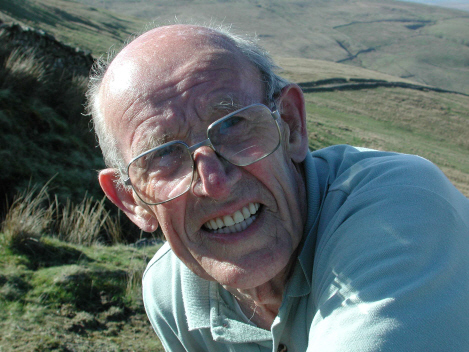 His fondness and love of tracks and paths resulted in him becoming a founder member of the Rough-Stuff Fellowship in 1955. There are times when I look at an old photograph... taken in 1955 at Dalton Lees near Parbold, Lancashire... the occasion being a "Meeting" of enthusiastic cyclists to discuss the formation of a Lancashire Group of the newly formed ROUGH STUFF FELLOWSHIP. I am so sad as I look at the photograph to recall the faces of so many of those who have passed on... and now to my deepest sorrow is that of another one... a stalwart of this great Fellowship of ours... that of Bob Harrison. I recall the day so well... of meeting him for the first time, and shaking his hand in a bond of cycling friendship and fellowship that was to herald the beginning of years of our particular "type" of cycling... love of the byways, the hill tracks, ancient packhorse roads and trails of yesterday. Here was a cycling man of adventure whose wheels seemed to know every elusive "dotted line" on the maps of Lancashire, The Yorkshire Dales, the Lake District and other areas. Sunday meets became a regular thing, and countless times Bob would lead us over, hitherto unknown to us, adventure trails up, along and down the moorlands and fell country that lay virtually on our doorstep. Favourites were the Bowland Fells - Brennand, Fairsnape, Beatrize, Johnny Pye's, Langdon Brook, Bleadale, Middle Knoll and others to numerous to mention. There would be the popular "drum-ups" by some beck or stream, the chatter, the laughter as we would plan future "crossings" and recall past ones. Always, Bob would be there with his camera to recall it all, for he was an expert with his eye for the beauty all around and to preserve on film and slide the joy and happiness that always radiated. Later on, there would be lovely evenings at his home, where healthy appetites would make light work of potato pie and other "goodies" produced by his good wife, to be followed by the unforgettable slide shows recording our adventures in glowing colour. Countless were the camping and hostel weekend "get-togethers" and meets he organised, the recollections and remembrances of which will live on to those of us who took part. There is a "fateful" line of a well-known hymn..." Time like an ever rolling stream, bears all its sons away". It is something we have to accept as our own "allotted" lifespan creeps on... and, alas, I am so full of sorrow as my 1955 photograph, recording a milestone in the beginning of the Fellowship, shows me in its silent way the face of a man whose memory and devoted years to the Fellowship will live on. His memory will be added to the many I, and others, treasure in our vault of inner memories. To you, therefore, BOB HARRISON... Stalwart of the R.S.F., Gentleman of the road, Good Friend and Companion of all that is good in cycling, we say FAREWELL and SALUTE YOUR MEMORY. As an ex RSF member I was deeply saddened to hear of the death of Bob Harrison. I cycled on many occasions with Bob and always found him to be an interesting and fascinating man. The words that come to my mind to describe him are "gentle man". Bob was always pleasant and treated me and the other ladies with the utmost respect. I enjoyed many trips with Bob and other members of the RSF, with memories of Rivington Barn, Youth Hostels up in Yorkshire and many of the hard, wet rides led by Geoff Newey. The trips to Bob's home were wonderful experiences where his delightful wife Mary would feed the many ravenous cyclists with large quantities of homo made stew and apple pies. On every camping trip we shared he would invariably have a large bowl of custard after his evening meal, I have fond memories of him sitting by his tent tucking into the said bowl of custard and pulling my leg over some aspect of the ride we had just done. Goodnight "Custard Face", a Gentleman that I will never forget. As someone lucky enough to have cycled with the late Bob Harrison I remember him with pride. He was unquestionably the most respected of men, a steady chap, kind, our steersman, pilot and leader; a 'Wigin lad'. Such good company. Bob knew ail the ways, and the ways in between. He was reliable, brilliant with the map and lots of fun. Bob was like nobody but himself, he enjoyed a challenge in a spirited way, never racing along but keeping to a steady pace. It was good to tread the same path. Well, Bob's gone and we remain, for now: his memory endures. Wintry weather and dark days, but we look forward to the Spring. Daffodils will reappear, and somewhere on a hilltop we'll all regroup, catch our breath, feel the sweet wind that blows there and talk of other days; it cannot be bought, it's priceless. We will recall with warmth and affection our good companion Bob, I reckon he will be there with us saying in that deep soft Wigan dialect - "Wossupwithi?". Itwer a right good do.